I adapted this recipe from one online that used flour. I’ve substituted the flour with a combo of brown rice flour and almond flour. You can also use a wheat free flour mix that is premade. I thought they turned out better than ones made with flour! The most important thing is that you have good crabmeat. If you like spicy, you’ll have to add some cayenne or sriracha. These are tasty with a lot of flavor, but not spicy. My adult kids voted this for our Thanksgiving night dinner. They were fabulous! At 8 gm net carbs and 19 of protein, these are a nutrition packed, guilt free entree. See bottom of page for a PRINTABLE recipe. 2 T coconut oil for cooking, may have to add more if you have two batches. Combine all ingredients in a bowl and using your fingers, blend well. Shape into patties. Makes 6-8 small to medium crab cakes. Heat a non-stick skillet (I use Cuisinart Green Gourmet) on medium, add coconut oil, and carefully place cakes in once oil is hot. Cook 5 min/side or until lightly browned. You want them to cook slowly because you want the egg to cook and the crabmeat to warm thoroughly. Make a remoulade sauce or tartar sauce to go with. We had these with green beans and zucchini slices sauteed with shallots and parsley and a “remoulade” of sriracha mixed with mayo and relish. 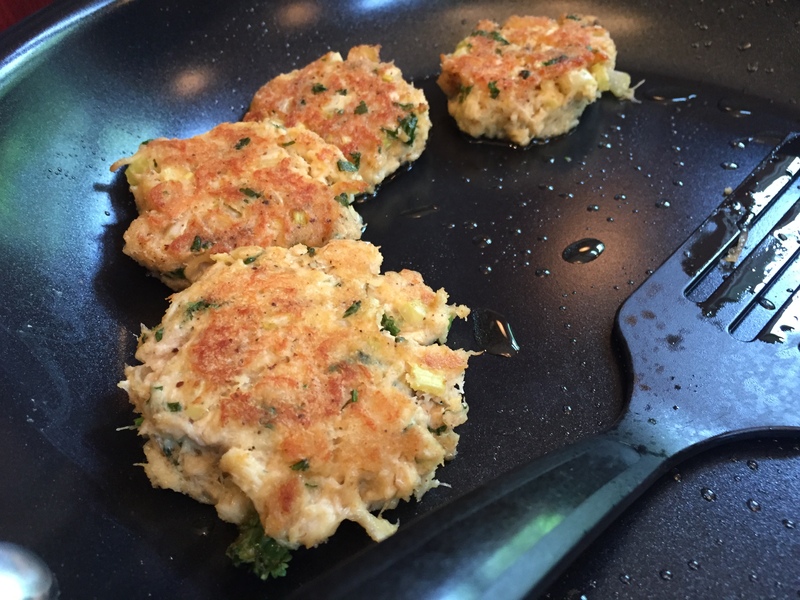 Add sriracha to your batter or on top of the cooked crab cake if you want a kick. Thanks! Give them a try!